Harold Clayton Urey (April 29, 1893 – January 5, 1981) was an American physical chemist whose pioneering work on isotopes earned him the Nobel Prize in Chemistry in 1934 for the discovery of deuterium. He played a significant role in the development of the atom bomb, but may be most prominent for his contribution to theories on the development of organic life from non-living matter. During World War II Urey turned his knowledge of isotope separation to the problem of uranium enrichment. He headed the group located at Columbia University that developed isotope separation using gaseous diffusion. The method was successfully developed, becoming the sole method used in the early post-war period. After the war, Urey became professor of chemistry at the Institute for Nuclear Studies, and later Ryerson professor of chemistry at the University of Chicago. Urey speculated that the early terrestrial atmosphere was probably composed of ammonia, methane, and hydrogen. 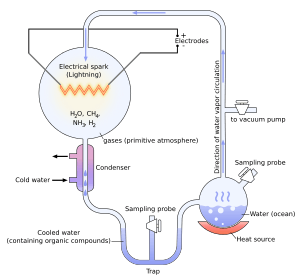 One of his Chicago graduate students was Stanley L. Miller, who showed in the Miller–Urey experiment that, if such a mixture be exposed to electric sparks and water, it can interact to produce amino acids, commonly considered the building blocks of life. Work with isotopes of oxygen led to pioneering the new field of paleoclimatic research. In 1958, he accepted a post as a professor at large at the new University of California, San Diego (UCSD), where he helped create the science faculty. He was one of the founding members of UCSD's school of chemistry, which was created in 1960. He became increasingly interested in space science, and when Apollo 11 returned moon rock samples from the moon, Urey examined them at the Lunar Receiving Laboratory. Urey was educated in an Amish grade school, which he graduated from at the age of 14. He then attended high school in Kendallville, Indiana. After graduating in 1911, he obtained a teacher's certificate from Earlham College, and taught in a small school house in Indiana. He later moved to Montana, where his mother was then living, and he continued to teach there. Urey entered the University of Montana in Missoula in the autumn of 1914, where he earned a Bachelor of Science (BS) degree in zoology in 1917. After the United States entry into World War I that year, Urey took a wartime job with the Barrett Chemical Company in Philadelphia, making TNT. After the war ended, he returned to the University of Montana as an instructor in Chemistry. An academic career required a doctorate, so in 1921 Urey enrolled in a PhD program at the University of California, Berkeley, where he studied thermodynamics under Gilbert N. Lewis. His initial attempt at a thesis was on the ionization of cesium vapor. He ran into difficulties, and an Indian physicist published a better paper on the same subject. Urey then wrote his thesis on the ionization states of an ideal gas, which was subsequently published in the Astrophysical Journal. After he received his PhD in 1923, Urey was awarded a fellowship by the American-Scandinavian Foundation to study at the Niels Bohr Institute in Copenhagen, where he met Werner Heisenberg, Hans Kramers, Wolfgang Pauli, Georg von Hevesy, and John Slater. At the conclusion of his stay, he traveled to Germany, where he met Albert Einstein and James Franck. Around this time, William Giauque and Herrick Johnston at the University of California discovered the stable isotopes of oxygen. Isotopes were not well understood at the time; James Chadwick would not discover the neutron until 1932. Two systems were in use for classifying them, based on chemical and physical properties. The latter was determined using the mass spectrograph. 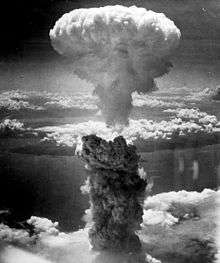 Since it was known that the atomic weight of oxygen was almost exactly 16 times as heavy as hydrogen, Raymond Birge, and Donald Menzel hypothesized that hydrogen had more than one isotope as well. Based upon the difference between the results of the two methods, they predicted that only one hydrogen atom in 4,500 was of the heavy isotope. In 1931, Urey set out to find it. Urey and George Murphy calculated from the Balmer series that the heavy isotope should have lines redshifted by 1.1 to 1.8 ångströms (1.1×10−10 to 1.8×10−10 metres). Urey had access to a 21-foot (6.4 m) grating spectrograph, a sensitive device that had been recently installed at Columbia and was capable of resolving the Balmer series. It had a resolution of 1 Å per millimetre, so on this machine, the difference was about 1 millimetre. However, since only one atom in 4,500 was heavy, the line on the spectrograph was very faint. Urey therefore decided to delay publishing their results until he had more conclusive evidence that it was heavy hydrogen. Urey contributed a science article to The Scientific Monthly on Irving Langmuir, who invented atomic hydrogen welding in 1911 by utilizing 300 to 650 volts of electricity and tungsten filaments, and won the 1932 Nobel Prize in Chemistry for his work in surface chemistry. In later life, Urey helped develop the field of cosmochemistry and is credited with coining the term. His work on oxygen-18 led him to develop theories about the abundance of the chemical elements on earth, and of their abundance and evolution in the stars. Urey summarized his work in The Planets: Their Origin and Development (1952). Urey speculated that the early terrestrial atmosphere was probably composed of ammonia, methane, and hydrogen. One of his Chicago graduate students, Stanley L. Miller, showed in the Miller–Urey experiment that, if such a mixture be exposed to electric sparks and to water, it can interact to produce amino acids, commonly considered the building blocks of life. In the late 1950s and early 1960s, space science became a topical field of research in the wake of the launch of Sputnik I. Urey helped persuade NASA to make unmanned probes to a moon a priority. When Apollo 11 returned moon rock samples from the moon, Urey examined them at the Lunar Receiving Laboratory. The samples supported Urey's contention that the moon and the Earth shared a common origin. While at UCSD, Urey published 105 scientific papers, 47 of them about lunar topics. When asked why he continued to work so hard, he joked, "Well, you know I’m not on tenure anymore." ↑ Miller, S. L.; Oró, J. (1981). "Harold C. Urey 1893-1981". Journal of Molecular Evolution. 17 (5): 263–264. doi:10.1007/BF01795747. PMID 7024560. ↑ Silverstein & Silverstein 1970, p. 7. 1 2 Arnold et al. 1995, p. 365. 1 2 Housholder, Terry. "Kendallville graduate worked on Manhattan Project in World War II – Drr. 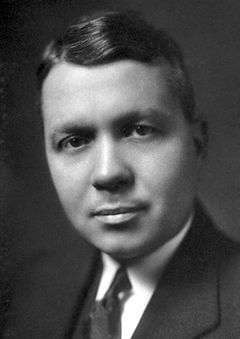 Harold C. Urey was Noble Prize Winner in Chemistry". KPC News. Retrieved August 7, 2013. ↑ Silverstein & Silverstein 1970, p. 8. 1 2 3 4 5 6 "Harold C. Urey". Soylent Communications. Retrieved August 7, 2013. ↑ Silverstein & Silverstein 1970, p. 15. ↑ Silverstein & Silverstein 1970, p. 72. 1 2 Silverstein & Silverstein 1970, pp. 19-20. ↑ Arnold et al. 1995, p. 366. ↑ Silverstein & Silverstein 1970, p. 26. ↑ Arnold et al. 1995, p. 367. 1 2 Arnold et al. 1995, p. 368. ↑ Silverstein & Silverstein 1970, pp. 37, 47-48, 72. ↑ "The Priestley Medal – 1973: Harold C. Urey (1893–1981)". Chemical and Engineering News. 86 (14). April 7, 2008. Retrieved August 7, 2013. 1 2 3 4 Brickwedde, Ferdinand G. (September 1982). "Harold Urey and the discovery of deuterium". Physics Today. 34 (9): 34–39. doi:10.1063/1.2915259. ISSN 0031-9228. 1 2 Arnold, Bigeleisen & Hutchison 1995, pp. 370-371. ↑ Urey, H.; Brickwedde, F.; Murphy, G. (1932). "A Hydrogen Isotope of Mass 2". Physical Review. 39: 164–165. Bibcode:1932PhRv...39..164U. doi:10.1103/PhysRev.39.164. 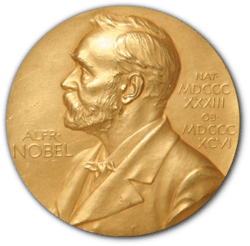 ↑ "The Nobel Prize in Chemistry 1934". Nobel Foundation. Retrieved August 7, 2013. ↑ Silverstein & Silverstein 1970, p. 47. ↑ Silverstein & Silverstein 1970, p. 45. ↑ Arnold et al. 1995, pp. 373-375. ↑ Arnold et al. 1995, p. 392. ↑ Urey, Harold C. (January 1933). "Dr. Langmuir, Recipient of the Nobel Prize in Chemistry". The Scientific Monthly. American Association for the Advancement of Science. 36 (1): 95. ↑ Arnold et al. 1995, p. 389. ↑ Arnold et al. 1995, pp. 377-378. ↑ Hewlett & Anderson 1962, p. 22. ↑ Hewlett & Anderson 1962, pp. 21-22. ↑ Hewlett & Anderson 1962, pp. 30-32. ↑ Arnold et al. 1995, p. 379. ↑ Hewlett & Anderson 1962, pp. 45, 50. ↑ Hewlett & Anderson 1962, p. 75. ↑ Hewlett & Anderson 1962, pp. 63-64. ↑ Hewlett & Anderson 1962, pp. 128–129. ↑ Hewlett & Anderson 1962, pp. 97, 108. ↑ Arnold et al. 1995, p. 381. 1 2 Hewlett & Anderson 1962, pp. 97–101. ↑ Arnold et al. 1995, p. 382. ↑ Hewlett & Anderson 1962, pp. 124-129. 1 2 Hewlett & Anderson 1962, pp. 629–630. 1 2 Silverstein & Silverstein 1970, pp. 51–52. ↑ Arnold et al. 1995, p. 383. ↑ Arnold et al. 1995, pp. 376–377. ↑ Arnold et al. 1995, pp. 389–390. ↑ Arnold et al. 1995, pp. 385-386. ↑ "Harold C. Urey – Biographical". Retrieved 2014-04-06. 1 2 3 Arnold et al. 1995, pp. 386-387. ↑ Silverstein & Silverstein 1970, pp. 62-64. 1 2 Silverstein & Silverstein 1970, pp. 66-68. ↑ Arnold et al. 1995, p. 393. ↑ Arnold et al. 1995, p. 394. ↑ Arnold et al. 1995, pp. 395-398. ↑ Cohen, K. P.; Runcorn, S. K.; Suess, H. E.; Thode, H. G. (1983). "Harold Clayton Urey 29 April 1893-5 January 1981". Biographical Memoirs of Fellows of the Royal Society. 29: 622–659. doi:10.1098/rsbm.1983.0022. JSTOR 769815. ↑ "4716 Urey (1989 UL5)". NASA. Retrieved August 9, 2013. ↑ "Harold C. Urey Prize in Planetary Science". Division for Planetary Sciences of the American Astronomical Society. Retrieved August 9, 2013. ↑ "Harold C. Urey Middle School". USA.com. Retrieved August 9, 2013. ↑ "Urey Hall". University of California, San Diego. Retrieved August 9, 2013. ↑ "Dr James R. Arnold". University of California, San Diego. Retrieved August 9, 2013. Arnold, James R,; Bigeleisen, Jacob; Hutchison, Clyde A., Jr (1995). "Harold Clayton Urey 1893–1981". Biographical Memoirs. National Academy of Sciences: 363–411. Retrieved August 7, 2013.